Uncategories Last update before final projections: did somebody say Liberal majority? Last update before final projections: did somebody say Liberal majority? Today is the last day of the BC election 2017. It means that I'll be spending the day using the latest polls (and every piece of info I can find) to make the final projections as well as writing a long post about them. This means that this blog post will be short. 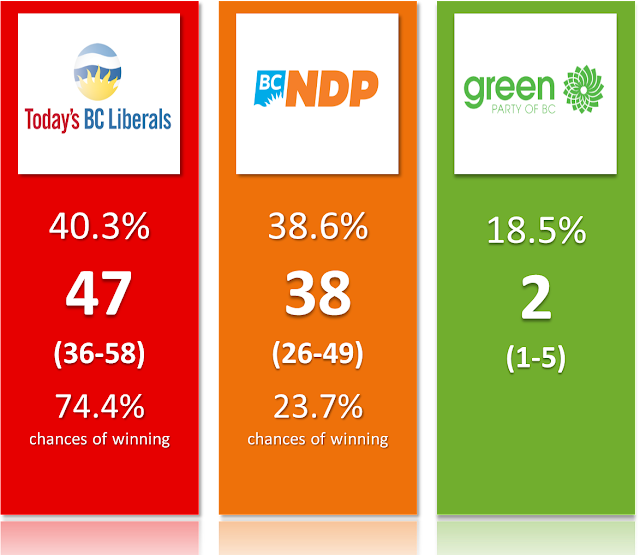 I have updated the projections using the 4 ridings polls on the island done by Oracle and published in the Time Colonist (here and here). These polls weren't good news for the Green. I also added the latest Mainstreet poll that not only provides province wide numbers, but 4 ridings polls (including one in common with Oracle). There as well, the riding numbers on the island (in particular in Saanich North and the Islands) aren't comforting for the Green (It seems this party published on their fb page an internal poll showing them ahead in Cowichan-Valley... when a party needs to do that, it's usually not a good sign). SNI should be the first gain made by this party and yet we now have two riding polls in a row showing them behind. When riding polls are different from my projections, I do an average of the two. Mainstreet poll is very interesting for multiple reasons. First of all, despite showing the BC NDP with a 1% lead province wide, the firm is calling for a Liberal majority. They justify it by saying the regional numbers favour the Liberals (very strong in the interior, holding in the Lower Mainland). On top of that, the riding polls show the BC Liberals higher than expected in Surrey-Fleetwood, Delta North and Fraser-Nicola. This seems to indicate a strong incumbency effect. If anything, the Liberals could make some gains in the interior, such as Skeena. For the Green party, there is the possibility that it'll receive more than 17% of the vote but only have one or two MLAs. If it were to happen, Andrew Weaver and the Green would become the best example of why electoral reform is needed (you know my position on this issue). By the way, Mainstreet and I aren't alone. Election Prediction will likely end up predicting a Liberal minority (41 seats called for the BC Liberals and 11 too close to close). The UBC prediction market is also suggesting the same outcome. And Teddy (that I know from Twitter) is suggesting an easy Liberal majority as well. I know the last source might lack credibility, but trust me, you usually don't want to bet against him. Anyway, that is all for now. Here below you can find the current possible outcomes as well as the detailed projections.